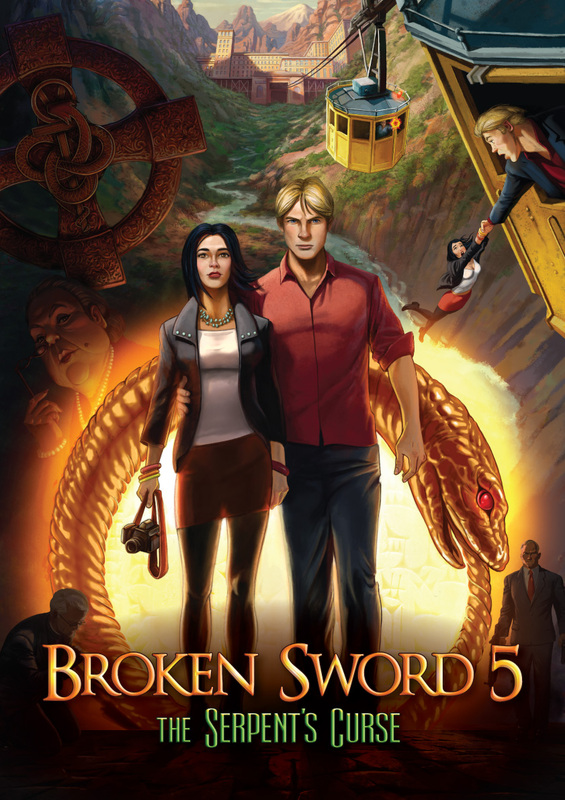 Part Two of Broken Sword 5 – The Serpent’s Curse begins right where Part One left off – George and Nico are stuck on the roof of a burning building with no escape in sight, as the antagonist smugly walks away. The only change? This time, the lights and sounds of incoming sirens as the game fades to black. George and Nico appear in a new location after that with barely a word about their predicament. How did they get down? And why were they just set free with Inspector Navet drilling them so hard during the entirety of Part One? None of these questions are answered, and this scene serves as a poor introduction to Broken Sword 5: Part Two. Unfortunately, these sorts of issues continue throughout the game, leaving the player with a poorly-written second half to an otherwise quite good adventure game. 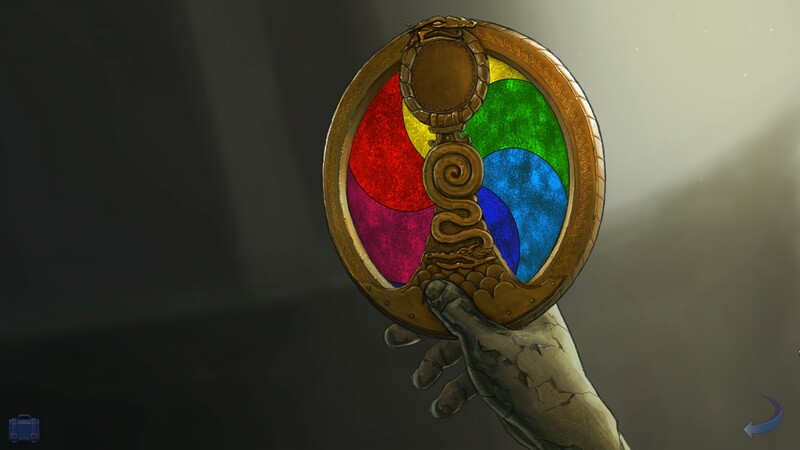 While the first part of Broken Sword 5 focused heavily on the murder mystery and hinted at the involvement of Gnosticism, the second half focuses almost entirely on the mystical. 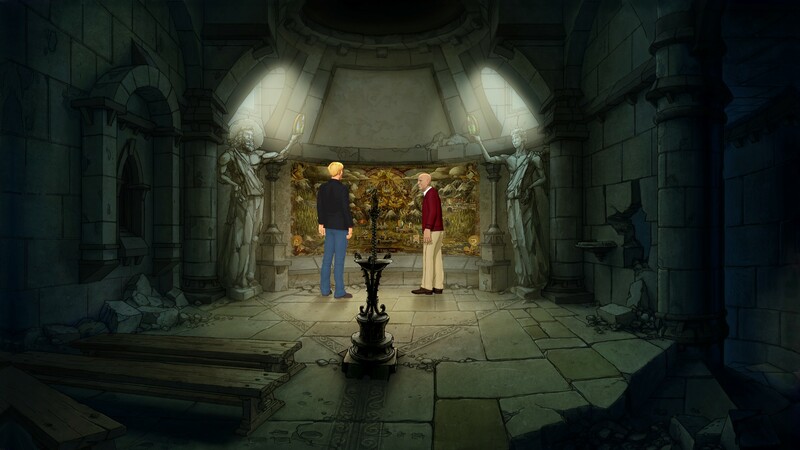 This early room sets the tone for the second part of Broken Sword 5, with a heavier focus on Gnosticism and a small shift away from the murder mystery. Mechanically, adventure games are what they are thanks to the puzzles, and, here, at least, Broken Sword 5 does not disappoint. Inventory items are used in interesting ways, and, aside from one puzzle involving making a musical instrument out of a scaffold full of tools, the solutions follow logically. You can see the items in the background that you need to interact with to solve a problem right away, and a bit of thought into your inventory items on hand will usually enable you to solve the puzzle in short order. Some solutions even involve simply talking to characters, and discussing other characters and plot points with them. It seems minor, and ultimately turns character portraits into inventory items, but does feel like it breaks up the normal adventure game mold. Some of the puzzles seem simple at first glance, but require some out of the box thinking. If the player gets stuck, Broken Sword 5’s thoughtfully-designed hint system will give you less and less subtle hints the more you ask, eventually just handing over the solution. It’s a nice setup that allows the player to only get as little or as much help as desired, all without having to Alt-Tab to a walkthrough. This is a system I wish other adventure games would adopt. The presentation in Broken Sword 5 has improved quite a bit with Part Two. One of my complaints in Part One was that the game’s resolution was limited to 1280 x 720. Revolution Software has increased the resolution to 1080p, allowing the game’s beautiful artwork to really shine. The voice acting is similarly excellent, allowing for the good characters to be even more memorable. 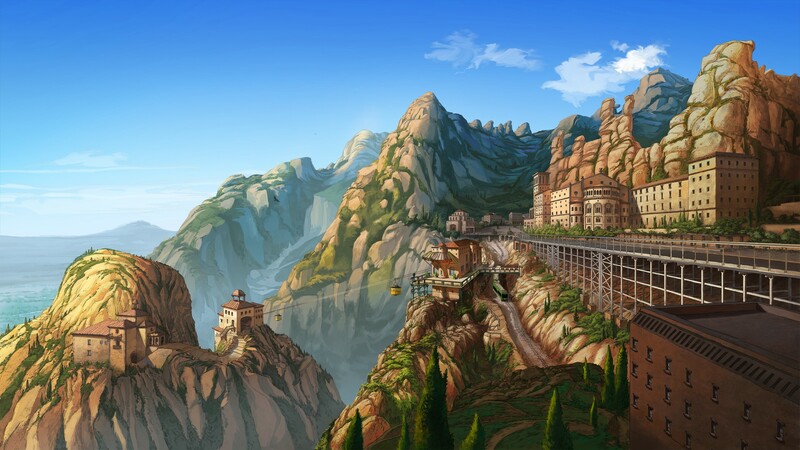 The art in Broken Sword 5 really is gorgeous, with the bump in resolution to 1080p helping a lot. This highlights some of the problem with Broken Sword 5 Part Two, however. A number of the memorable characters from Part One simply don’t show up, like the aforementioned Inspector Navet. 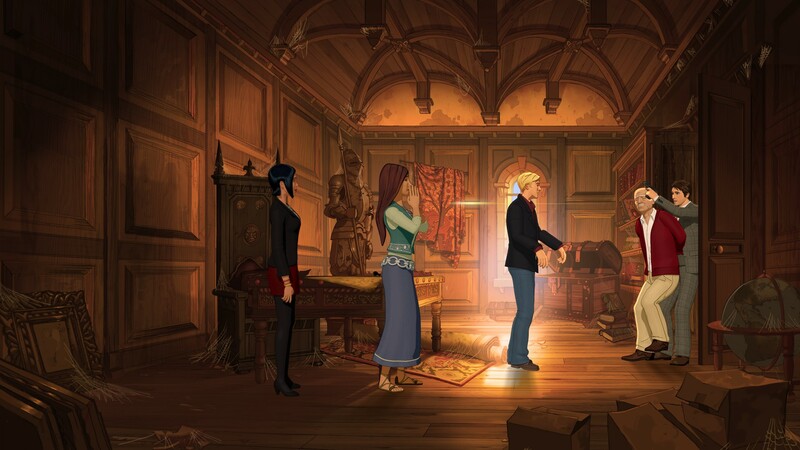 A number of new characters appear, including a cameo by a husband and wife from previous Broken Sword titles. They appeared as part of a stretch goal for the game’s Kickstarter, but their role could have been played by anyone, and their presence serves as a bit of a distraction. Meanwhile, Part Two introduces new characters, like Eva, who beg for more screen time. And the antagonist is the definition of a mustache-twirling villain, doing evil for the sake of evil, and barely divulging his motivations. It is frustrating to see so many characters with potential to be great simply wasted. Seen here with main characters George and Nico, Marques gets a fair bit of time and has a compelling story. Eva seems to have more to tell the player, but never gets the chance. Telltale Games has found great success in the episodic format, which makes other companies want to jump on board. Revolution Software attempted the same here with Broken Sword 5, with disappointing results. The jarring change in scene I mentioned in the introduction here is only one example of the poor pacing that occurs throughout Part Two. All too often, a scene change occurs with the text “A few moments later,” “A few hours later,” or something similar. It allows for the characters to do a little more globe trotting than they did in Part One, where they stayed in Paris with a brief hop to England. But it feels forced, and is used entirely too often over the four or so hours that Part Two contains. Broken Sword 5 Part Two has mostly great characters, some of whom would benefit from more time on screen. The beautiful art and solid mechanics round out a good package. However, adventure games live or die by their stories, and this one suffers from a rushed pace that really detracts from the overall quality. The overall package is heavily marred by Part Two’s storytelling. I still think this is a good adventure game as a whole, but the pacing and abrupt end mar the overall package and hold it back from greatness. This review is based on the Windows version of the game. Review copy provided by publisher, and is based on the Windows version.